The Center for Judaic Studies held a ceremony for its new Liberty Biblical Museum Monday, April 13 at 2 p.m. The museum features archeological artifacts from excavations headed by Dr. J. Randall Price, who is the executive director of the Center for Judaic Studies, curator of the museum and a Liberty research professor. After Falwell cut the ribbon, Price gave ceremony attendees a tour of the exhibits. Exhibits include copies of the Dead Sea Scrolls, a 200-year-old handwritten Torah Scroll, coins from the Roman Empire and an authentic Last Supper exhibit. Also included in the exhibit is rare stone from the walls of the 2nd Temple. 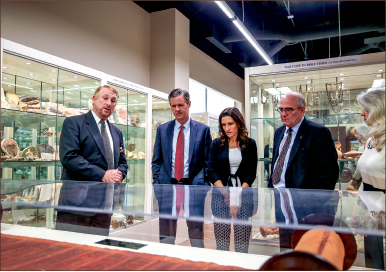 Falwell was also amazed at the artifacts that were displayed, stating that they were the kinds of items normally found in museums in Washington, D.C., and New York. According to Price, the space was originally going to be the new Jerry Falwell Museum. However, the Center for Judaic Studies received news early in 2014 that it would be occupying the spot in May, according to Administrative Assistant Ayelet Evans. Price said students have been trained to give tours of the exhibits for anyone interested. Exhibits can be viewed Monday through Thursday from 9 a.m. to 4:30 p.m. Friday tours are by appointment only, according to the Center for Judaic Studies pamphlet. However, Price said he hoped to eventually be able to install a sound system with earphones so students can walk up to each exhibit and listen to a more detailed description of the artifacts. For more information on the Liberty Biblical Museum and the Center for Judaic Studies, visit liberty.edu/judaicstudies. Brown is a copy editor. You have a misplaced modifier in the second sentence of this article.